While working with Excel, we are able to remove specific parts of a text string by using the REPLACE or SUBSTITUTE functions. This step by step tutorial will assist all levels of Excel users in removing text based on their position using two different methods. 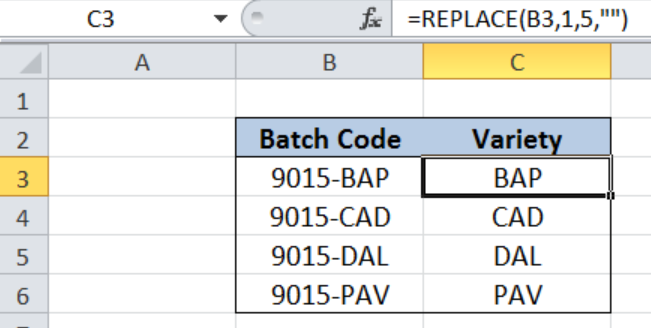 Our table contains two columns: Batch Code (column B) and Variety (column C). Each batch code contains the data for production date in Julian calendar, and the variety. We want to remove the production date and obtain only the variety. The resulting text string will be recorded in column C under “Variety”. 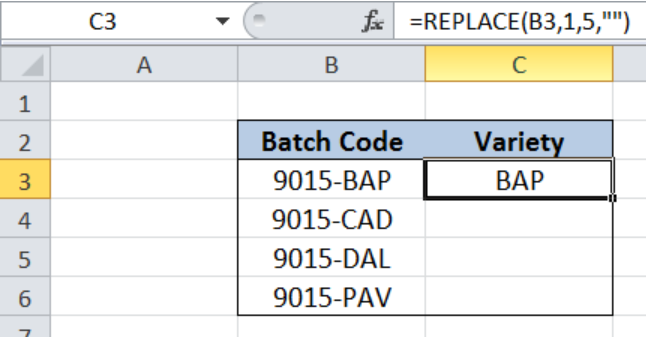 We want to obtain only the variety from each Batch Code in column B. Note that the position of the variety is constant in each batch code. 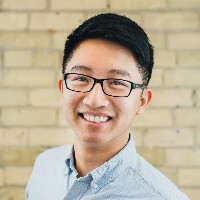 Old_text is the batch code in column B, while start_num is 1 and num_chars is 5, corresponding to the number of characters we want to remove “9015-”. Our formula replaces the unwanted characters with an empty string “”, starting from the first character up to the fifth character. As a result, the first five characters are removed, leaving the substring “BAP” in cell C3. Our formula directly substitutes the text string “9015-” with an empty string “”. As a result, we are able to obtain the variety in C3, which is “BAP”. 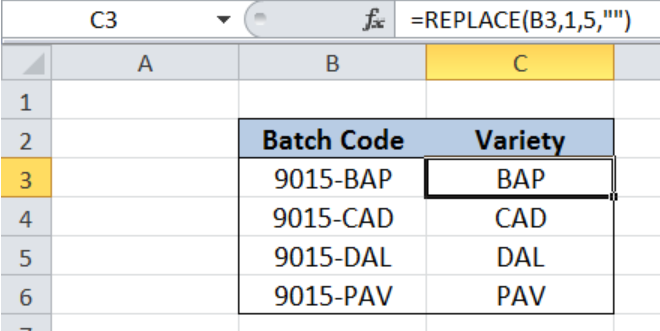 The results are the same as in the previous method using REPLACE.